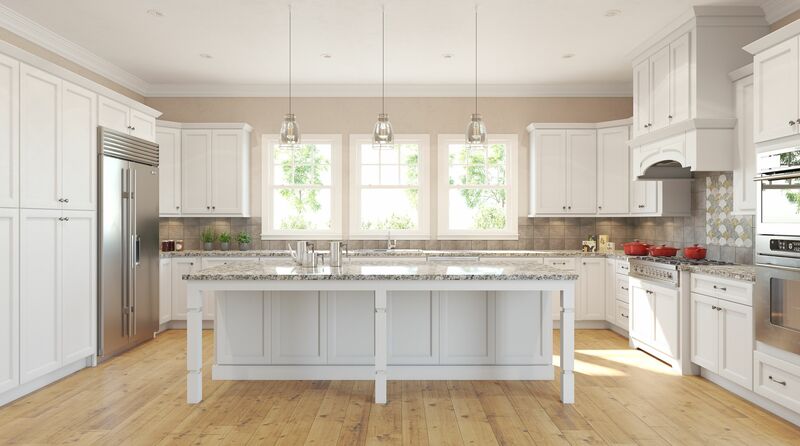 When you want a classic look for a white shaker RTA kitchen or bath remodel, our full overlay Newport White Shaker cabinets are sure to please. Our Newport White RTA kitchen cabinets are built with traditional craftsmanship to ensure a high-end product that's designed to stand the test of time. Face Frame: 1.5" wide x 3/4" Thick Solid Maple Painted To Match Doors & Drawer Fronts. Door specifications: Full Overlay Solid wood stiles and rails with HDF center panel to avoid cracking. Exterior: Pre-finished to match cabinet exterior. Construction: I-beam construction using brad nails and wood glue. All frames, sides and back panels have pre-cut dadoes for seamless construction. Buy RTA Newport White Shaker Cabinets Today! Buy Pre-Assembled Newport White Shaker Cabinets Today! When you're in the market to buy kitchen cabinets online, our business stands out as a leader. Online Cabinets Direct delivers only the finest cabinets for less. Our insistence on quality craftsmanship has made us the go-to source for cabinets for customers from all over the country. We take a great deal of pride in our work and it will show in your home. If your ready to order shaker style cabinets, were here to assist. Just shop our convenient online store or contact us directly for assistance. At Online Cabinets Direct, we are always happy to answer any questions you may have.